"Mr. Chairmen, while economic progress must take place, there is no reason why this progress should so drastically change our way of life that we lose our culture, that sense of who we are. That is perhaps the most important reason that this commission should pursue projects like the Delta Cultural Center in Helena, Arkansas which would help to preserve and interpret the rich cultural heritage of the Arkansas and Mississippi Delta region. Through organized events, exhibits, and programs, this center would give the people of the Delta the sense of community that is so badly needed there as well as work to preserve the region's unique cultural aspects. I have seen the importance of doing this through my work at the Helena Blues Festival. This October will be the 3rd year that the event has taken place and I would like to take this time to invite each of you to come and join us. You could then understand what an event such as the Festival can do for the morale of the people in that area." 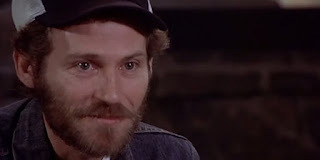 Helm proved a powerful force in Helena and Washington D.C. Having come up in Marvell, the famous drummer/singer was an eager ambassador for Arkansas. 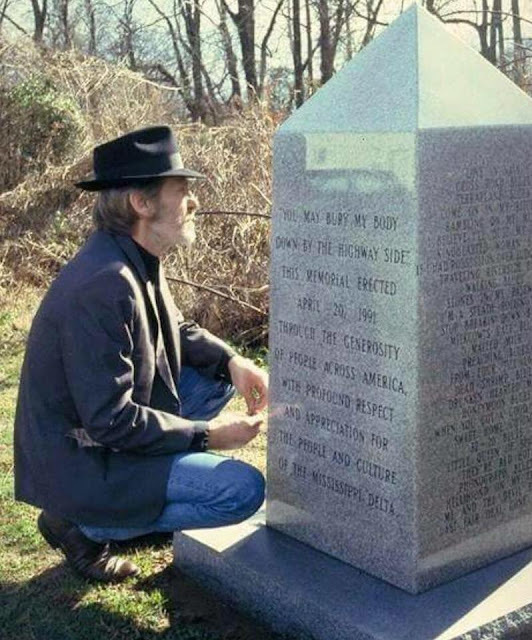 He had been the feature artist at the 1987 King Biscuit Blues Festival, which served as a major step up towards welcoming as many as 40,000 in 1988 and over 100,000 in the early nineties. His support of the cultural center in Helena may have been the final, deciding factor in the decision of the governor in 1989. At the historical setting of Centennial Baptist Church, Gov. Bill Clinton recently unveiled plans for the new Arkansas Delta Cultural Center in Helena. Economists project that within 5 to 6 years the center will bring between $3 and $6.5 million into the local economy as well as create 134 new jobs in the newly-created tourism and tourism-related industries. 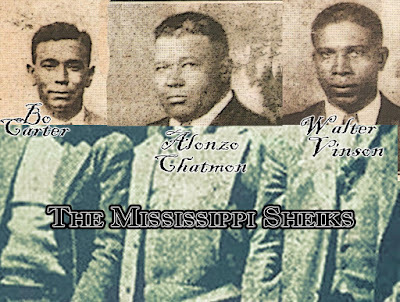 “It has been my vision for many years to establish a center that preserves the history and culture of the people of the Arkansas Delta,” Clinton informed, and he wanted to recognize the people who developed the region into a “land of opportunity and economic prosperity.” In his vision, the center celebrated the “rich culture and dramatic past as well as symbolizing hope” in overcoming all the challenges “to make the Delta of tomorrow a better place.” Clinton made the announcement at a press conference prior to the opening of-the Arkansas Public Hearing of the Lower Mississippi Delta Development Commission. The site of the news conference, Centennial Baptist Church, is one of a handful of existing turn-of-the-century buildings in downtown Helena. It was designed by African American architect, Henry James Price, and built in 1905 at a cost of $30,000. 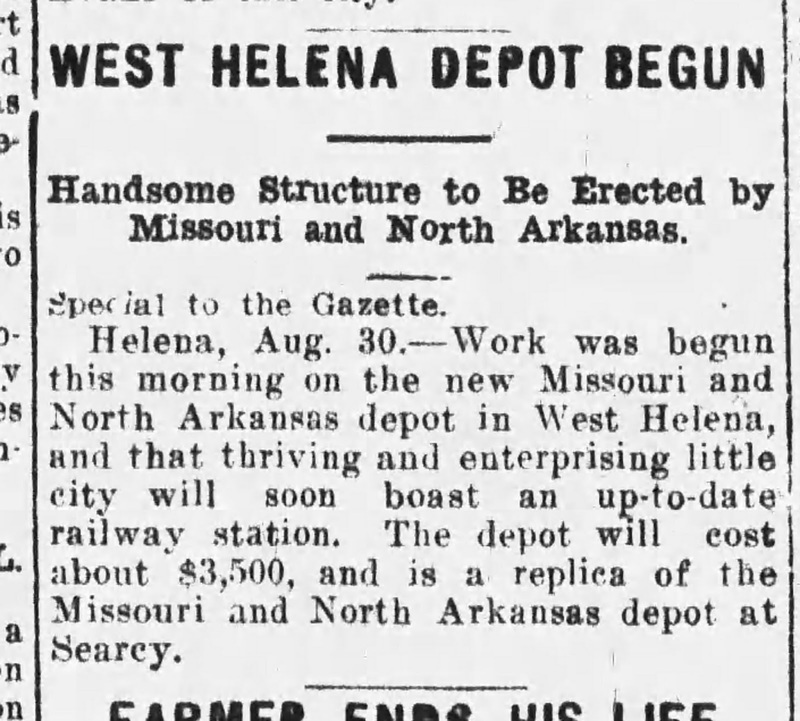 Daily Arkansas Gazette, Aug 31, 1912. The first phase of a six-phase, $8.5 million historic preservation and cultural resource management initiative was to restore the Missouri-Pacific Railroad depot in Helena and establish a visitor’s center for researchers and tourists. Built in 1912, the depot’s once enjoyed a bustling lobby filled with passengers, and architects planned to restore the almost eighty year-old room to look much like it did in its earliest years. The information desk, in addition, would look like “an old depot or bank teller window,” and it would provide maps and other information about historic sites and events across the Delta. The center was going to feature an exhibit titled: “The Arkansas Delta: A Landscape of Change,” which revealed the diverse nature of experiences in the Delta through a series of panels featuring text and photographs as well as videos, documents, and artifacts The initial display, “River Country,” explained the difficulties of the natural environment that impeded settlement in the Delta, and it employed the use of film to show historic newsreels of floods as well as workers building a levee. The artifacts included in “Life on the Frontier” helped demonstrate the acerbic nature of life for the early settlers. By constructing an exhibit using farm implements, murals depicting farming methods, and footage of farming in the early half of the twentieth century, “Rural Life: Living on the Land” explained the persistent historical role of agricultural development in Mississippi. Other panels describe the social and cultural life of Native Americans in the Arkansas Delta, explain the geographical attraction that drew large groups of immigrant’s merchants to the region, interprets the significance of the Civil War as well as the complexities of racial discourse in the New South. Children as well as adults, moreover, have the opportunity to climb into the navigator seat of a caboose, which sits adjacent to the property. 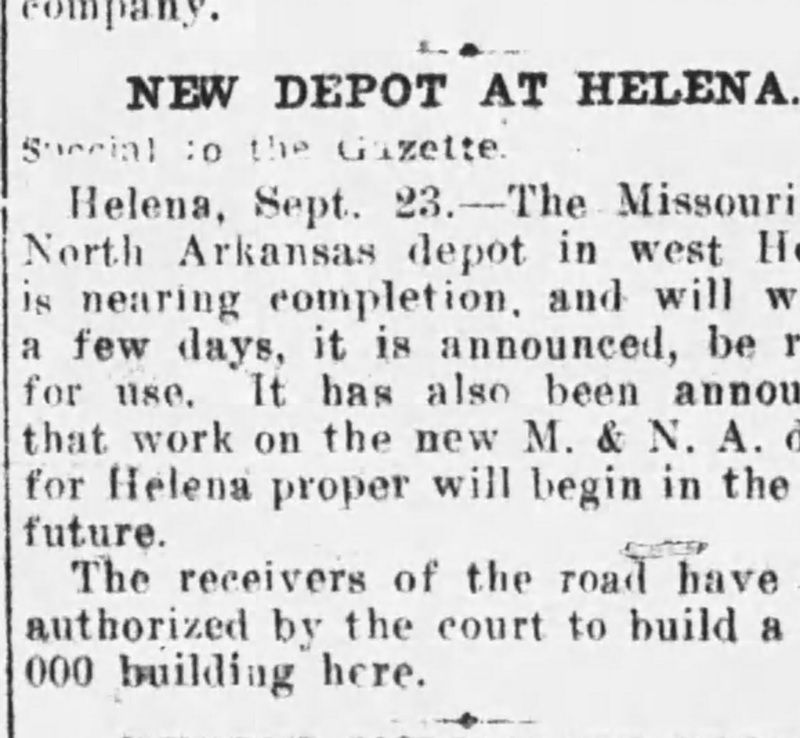 Daily Arkansas Gazette, Sep 24, 1912. The following phases of the project included the development of an interpretive walking tour along the Mississippi River, the procurement a few suitable buildings: 1) to establish an archive and an art gallery, 2) to setup an interpretive center and house major exhibits, and 3) to open a twenty-five room bed and breakfast. The bed and breakfast will be housed in the Missouri Pacific Railroad depot which is located near the Mississippi River levee in downtown Helena. 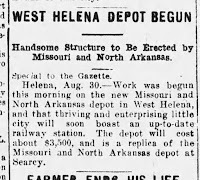 The Union Pacific Railroad and the City of Helena were responsible for the donation of the building and grounds for the centerpiece of the project. With the renovation of the historic depot beginning in October, the architectural workers hoped to complete their work in less than a year, which might allow its grand opening to coincide with the annual King Biscuit Blues Festival. Daily Arkansas Gazette, Apr 19, 1913. “First Phase of the DCC Set to Open This Fall,” Marianna (AR) Courier, Sep 6, 1989, p.16. 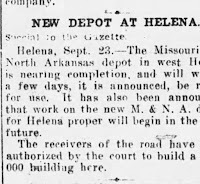 “Plans made to build Arkansas Delta Cultural Center in Helena,” Marianna (AR) Courier, Sep 14, 1989, p.11. United States Congress Senate Committee on Environment and Public Works, Lower Mississippi Delta Development Act: joint hearing before the committees on Environment and Public Works and Small Business, United States Senate, One Hundredth Congress, second session, on S. 2246, a bill to establish the Lower Mississippi Delta Development Commission, June 28, 1988 (Washington, DC: U.S. G.P.O., 1988), 96.